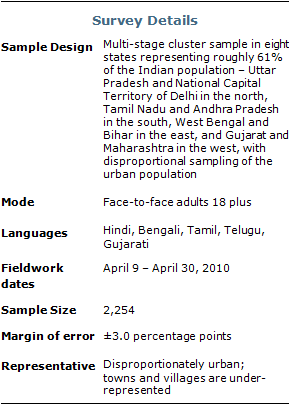 The table provides details about the survey’s methodology, including the margin of sampling error based on all interviews conducted in India. For the results based on the full sample, one can say with 95% confidence that the error attributable to sampling and other random effects is plus or minus the margin of error. In addition to sampling error, one should bear in mind that question wording and practical difficulties in conducting surveys can introduce error or bias into the findings of opinion polls.